Let's face it, today in your agency, someone could be abused by one of your staff – whether intentionally or unintentionally. Despite background checks and staff training, a child or a well-meaning adult often does not report an abusive relationship until something grave happens. Abuse often occurs and recurs within settings without the administrator's knowledge. There are some things you can do now, however, to prevent this abuse and root out inappropriate behavior. As a service to you, I am writing today to invite you to a free training opportunity. This training is offered to your district to raise awareness of these important issues. The training also fosters support discussions at the local level and provides valuable resources to help administrators identify and prevent student abuse in your schools. Regularly review Mandatory Reporting policies/procedures; retraining required every three years. Provide training on Positive Behavior Support, crisis behavior management, physical intervention. Have PBS plans for students- make sure they work, are understood, used and regularly assessed. Optimize Incident Report for accountability, analysis, data collection by making it more objective than subjective. Have an incident report review process and data analysis schedule. Include mandatory debrief with staff involved. Have a critical eye for child abusers. Staff continually involved in behavioral compliance struggles can be a red flag. Have an open culture of communication such that all staff are committed to do the right thing for students. Root out micro-climates of secrecy and silence. Ensure program supervisors are in the loop on crisis management procedures. For example, many schools have special education programs supervised by building administrators who are not always included in staff trainings or student meetings. School security staff are also often not included. Address staff concerns early and effectively- don't let them get to the point for feeling frustrated and helpless. Maintain sufficient personnel and training documentation to establish your progressive performance management for employees suspected to be abusers. Provide a consistent and authoritative presence in programs (either yourself or delegates.) Your regular presence communicates that you care, are watching and holding consistent expectations. Make a regular part of your personnel reviews the assessment of student care standards, advocacy, problem solving and demonstration of ethics. Administrators need to take case management training with staff. Maintain consistent, qualified and trained subs. Provide debriefing/postvention time and resources as well as the expectation they be done. 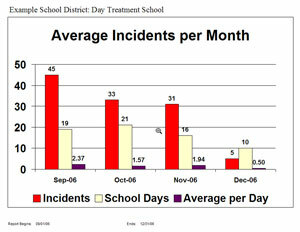 Would you like a copy of the presentation: Abuse Identification and Prevention for Administrators? Contact us to request this at no charge. To assist you with the analysis process, the RIGHT RESPONSE Incident Tracking Database will track and evaluate incidents from one or more programs. Analysis centers on three main areas for concern: incident cause, intervention response and resultant outcome. "The workbook was essential. I feel having to write information down will help me to really know it. Interaction and discussion vital to the workshop. All of the deomstrations from Charlie as well as our practice times, crucial for proper training."